Lamb Osso Buco is a delicious recipe for Two using lamb shanks, instead of veal or pork shanks, that is sure to please your family and guests. Traditionally, Osso Bucco is made with veal shanks and served with risotto as the traditional side dish. 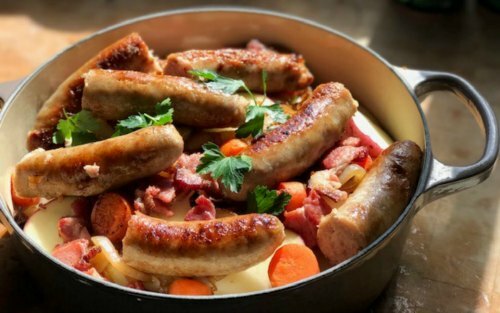 I know your family and friends will love this recipe. I adapted this Lamb Osso Buco for Two recipe from Food and Wine Magazine. 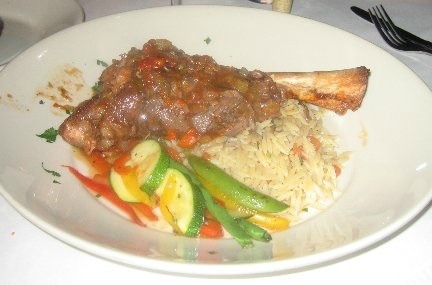 * Lamb shanks are an inexpensive cut of lamb that comes from the latter part of the fore or hind leg. Lamb shanks are best roasted or braised. Shanks are almost always cooked in liquid until the meat starts separating from the bone. ** Learn how easy it is to make your own homemade chicken stock. In a large, heavy skillet (I like to use my cast-iron skillet over medium-high, heat 2 tablespoons of the olive oil. Add the lamb shanks, season with salt and pepper and cook over moderate heat until well browned all over, approximately 10 to 15 minutes. Transfer the shanks to a large roasting pan and pour off the fat. Heat the remaining 2 tablespoons of olive oil in the same skillet. Add the garlic, onions, carrots, and celery; cook over moderate heat until softened, about 10 minutes. Add the wine, bring to a boil over moderately high heat and simmer for 3 minutes. Add the tomatoes, chicken stock, orange zest, oregano, and 2 tablespoons of the parsley; bring to a boil. Pour the mixture over the lamb and cover with foil. Bake in the oven for about 3 hours, or until the lamb shanks are very tender. Remove from oven. Increase the oven temperature to 350 degrees F. Transfer the lamb shanks to a large, deep baking dish, cover with aluminum foil and keep warm. Pour the sauce and vegetables into a large saucepan, discarding the strips of orange zest. Simmer the sauce over medium heat, skimming the surface occasionally, until richly flavored, about 15 minutes. Season with salt and pepper and pour it over the lamb shanks. Cover the dish of lamb shanks with foil and bake for about 10 minutes, or until they are heated through. Set a lamb shank on each plate and spoon some of the sauce over and alongside. Garnish with the remaining 2 tablespoons of parsley and serve. MAKE AHEAD: The recipe can be prepared through Step 3 and refrigerated overnight. Spoon the cold fat from the surface and bring the lamb shanks to room temperature before reheating them in a 325 degree F. oven for about 45 minutes.